We’ve all been there: Meatballs that don’t brown evenly… meatballs that get misshapen and flat if you fry them and sit in their own grease if you bake them. Jean Rindfuss believed making a decent meatball could be easier, more convenient and healthier… and, she was right. 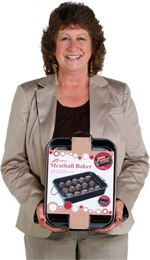 Jean brought her idea to Davison and the innovative Meatball Baker was developed. The Meatball Baker features a unique rounded rack system that holds meatballs, shish-kabobs and a variety of other foods so they keep their shape, bake evenly and steer clear of grease. Her product was an immediate hit when it debuted on QVC in 2009 – it sold out in under a half hour. Today, Jean’s Meatball Baker is on shelves and available online from dozens of stores.